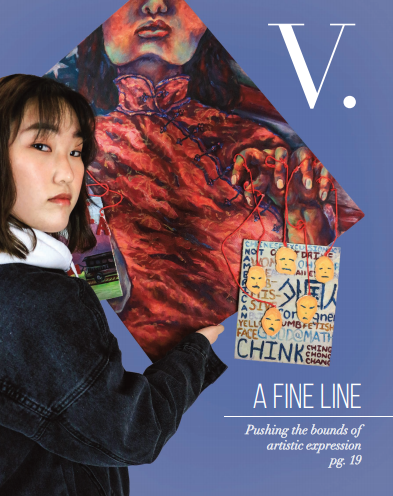 In this issue, Photo Director Lucia Amieva-Wang captures senior Rebecca Cheng’s controversial painting “The Puppet Master,” which was removed from its display at the PAUSD district office for its inclusion of racial slurs. Our decision to print the painting in its entirety on the cover was driven by AP Style guidelines. While writing the story, staff writers Kaitlyn Ho, Kobi Johnsson and Sasha Poor examined multiple opinions about the district’s decision to take down the art. They interviewed Cheng and students who experienced comparable censorship situations, but also the district art director who made the call on removing the painting from the district office. “I thought it would be interesting to talk to the people who have been censored, but also to people who weren’t directly involved in it to see what the general consensus might not be regarding a specific incident,” Poor said. Ho, who has a background in art and supported including the original artwork on the cover, found writing the story compelling as it debated the place of line-pushing art in society. After these staffers wrote the story, designed and placed it in the final document along the rest of the issue, the magazine’s adviser, Paul Kandell suggested treading lightly on the decision to include the full artwork on the cover with the slur. After staffers were long gone, the leadership team stayed behind two extra days in search of a correct journalistic decision, producing many varying versions of the cover — one with a grey gradient box overlaying the slur, another with the headline covering the slur and one with a photo that obscured the slur with Cheng’s body placement. COVERING IT UP EIC Ashley Hitchings sits at a computer on the last day of production producing multiple version of cover proposals. Fueled on after-production chips and salsa, she rehashes advice they received from professional journalists with her fellow EICs. They held prolonged conversations touching on the ethics, personal biases and how this would impact our magazine’s reputation with Palo Alto High School families. They contacted professionals in the field of journalism for a third opinion beyond theirs and that of our adviser’s. As stated in the letter from the editors’, they decided based on “consultation of AP Style guidelines and conversations with professional journalists, including associates of the Asian American Journalists Association and the Northwestern-Medill School of Journalism.” To include the opinions of the staff members, the EICs brought the decision for a discussion and vote in class — the staffers overwhelmingly supported printing the full art on the cover, undisturbed.